By eating just one serving of these green eggs you will have reached your daily requirements of vitamin K and vitamin A, almost all the manganese and folate your body needs. It is an excellent source of more than 20 different measurable nutrients, including dietary fiber, calcium and protein. Now how is that for starting off your day! The secret – SPINACH! Popeye really knew best! Now what a fun way to re-create a dish from one of my kid’s favorite Dr. Suess Books. I feel great knowing that my kids eat practically a whole salad for breakfast. 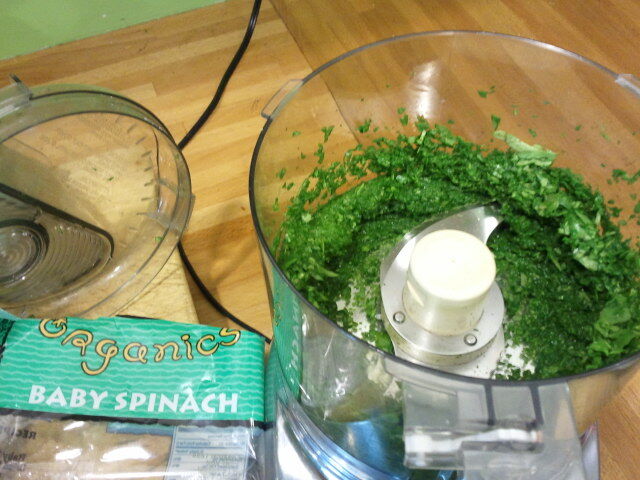 I start off by throwing a whole bag of organic spinach in the food processor, which turns into a small amount of paste. I store this in my fridge and use throughout the week. I add about 1 tablespoon of spinach for every 2-3 eggs. Scramble the eggs, adding a little bit of garlic, salt and pepper. 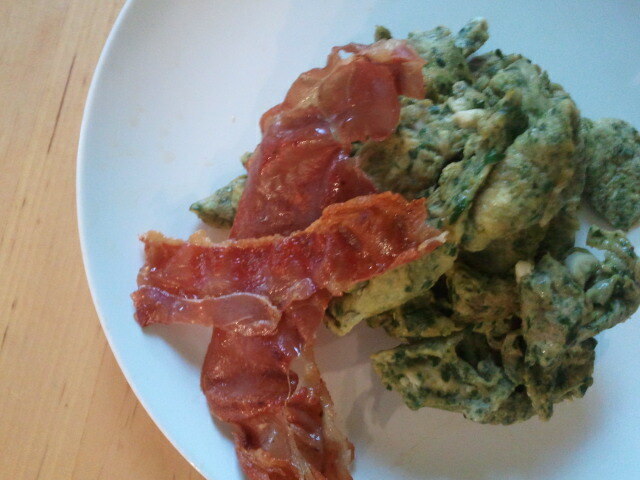 Sometimes I add some grated parmesan on top and I like to serve it with crispy proscuitto. Proscuitto is nice for a change, and cooks up really fast. Great for a quick breakfast. My kids ask for green eggs all the time, and I am happy to oblige! * Tip- do NOT skip out on the egg yolks people – they are loaded with nutrients like choline and lutein. Despite what you may have heard, having 2 eggs a day along with a balanced diet will not raise your cholesterol. There are also alot of health benefits to eating raw eggs. This entry was posted in Gluten Free, Life and tagged gluten free, scd. Bookmark the permalink. Michelle I am thoroughly enjoying your recipes and nutritional information on your GF site. Thank you for the resource.